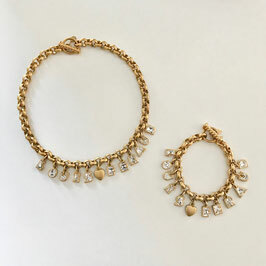 Rare statement charm letters necklace and bracelet set by Louis Féraud from the 1980s. 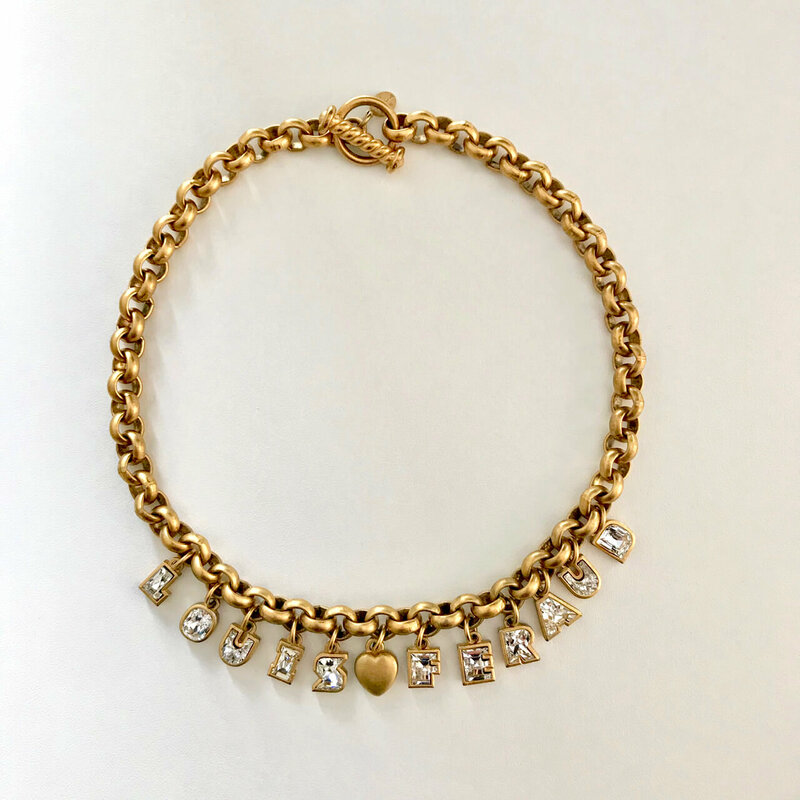 This Louis Féraud gold tone necklace and bracelet set features each a massive gold tone chain, clear rhinestone filled "LOUIS FERAUD" charm letters and a heart-shaped charm between. 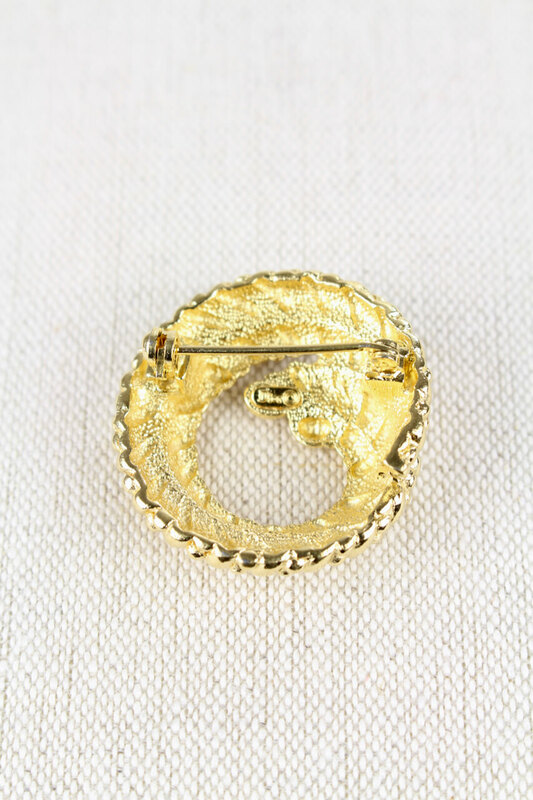 Toggle clasp closure. 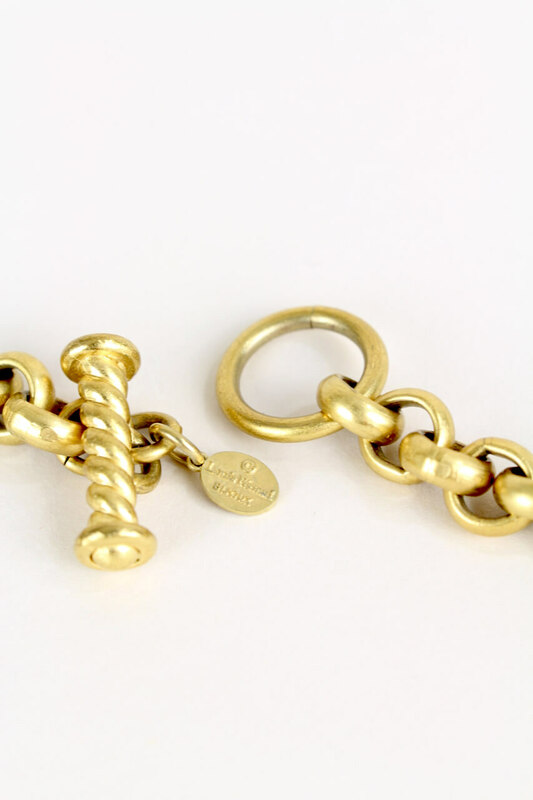 Both pieces are made in France and signed with the Louis Féraud BIJOUX signature hang tag. 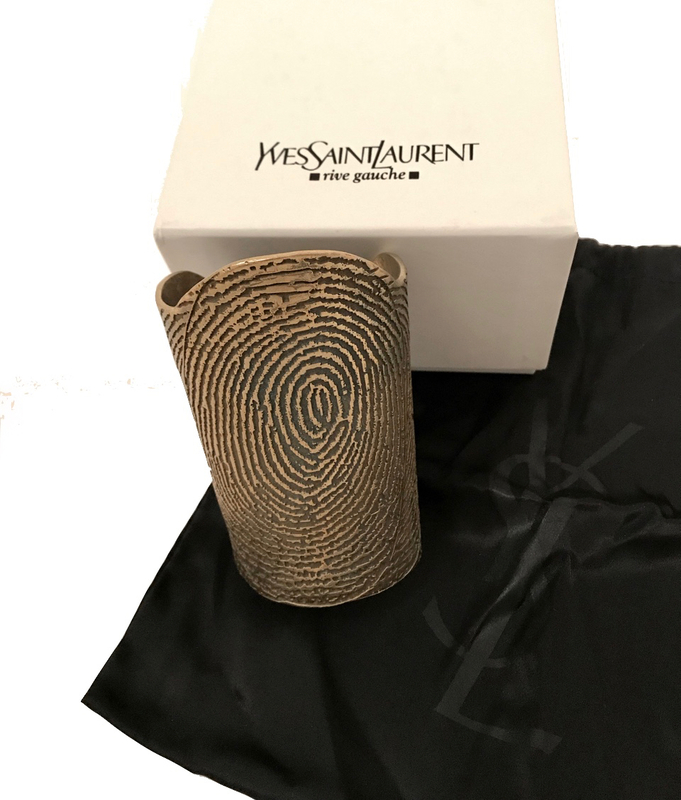 Length: 43 cm – 16.9"
Height of letter charms with bale: 1,5 cm – 0.6"
Length: 21 cm – 8.3"
Outstanding fingerprint design cuff bracelet by Yves Saint Laurent, S/S 2011. 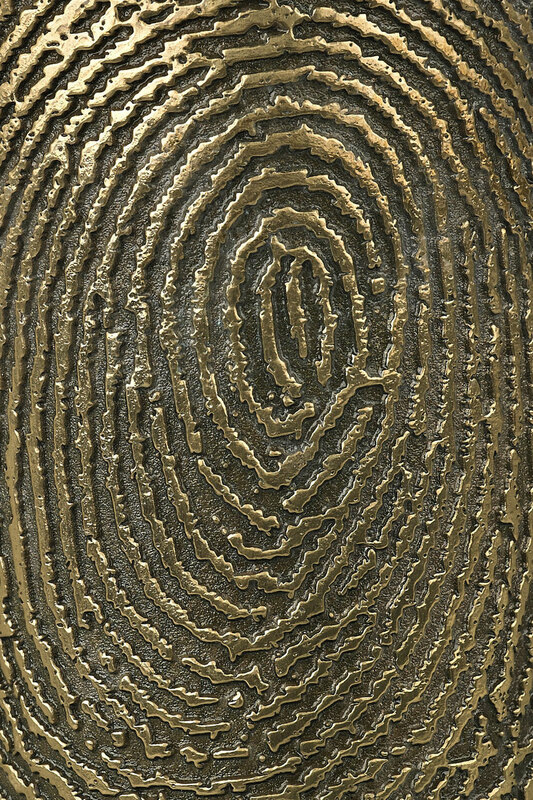 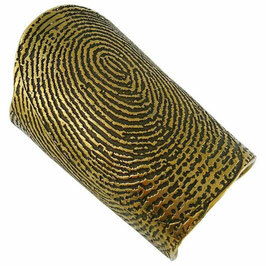 Iconic Spring/Summer 2011 Yves Saint Laurent YSL massive runway fingerprint design cuff bracelet. This wide gold toned cuff bracelet has been designed by Stefano Pilati and features an embossed fingerprint design with antique patina, irregular edges and a designer stamp at hammered interior. 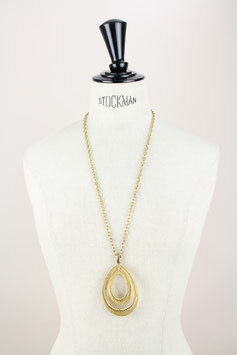 It is wider at one end and comes in its original logo marked black dust bag and white cardboard box. 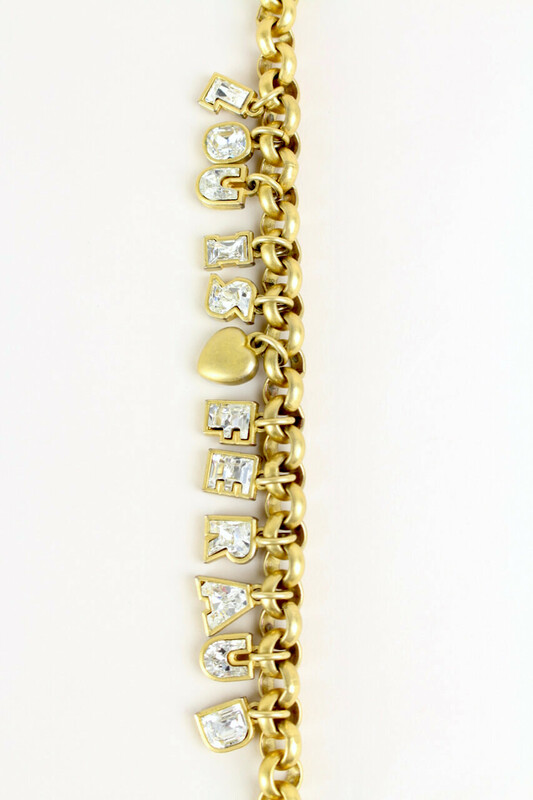 Maximum height: approx. 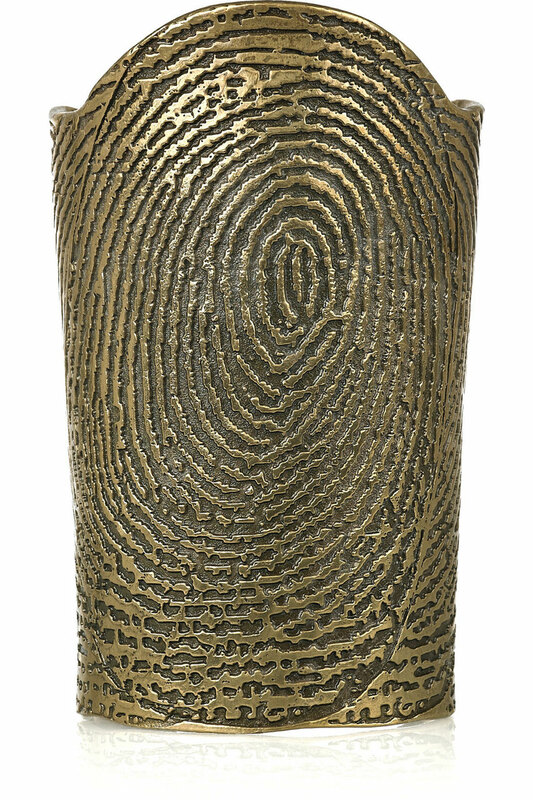 11,5 cm – 4.5"
Minimum inner circumference: approx. 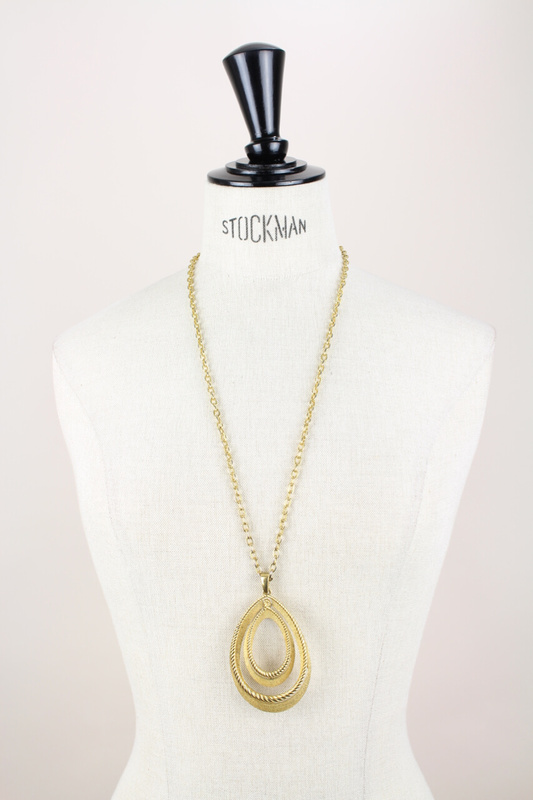 13 cm – 5.1"
Maximum inner circumference: approx. 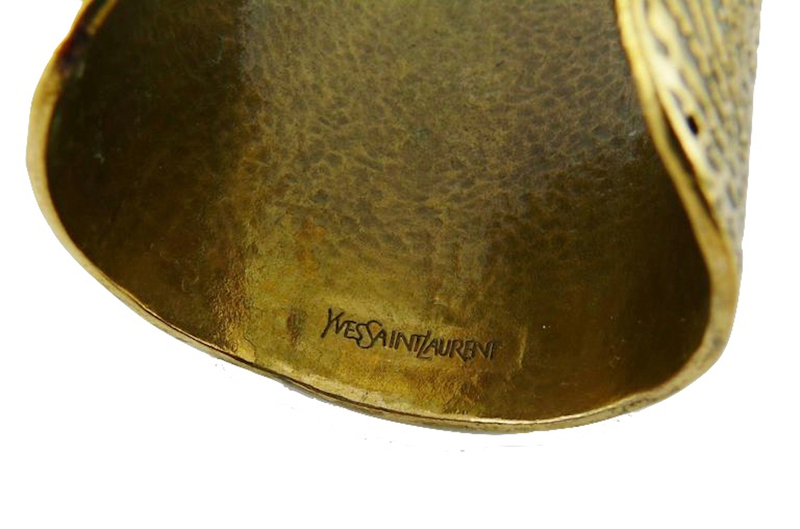 15 cm – 5.9"
Reference photos: Yves Saint Laurent Spring/Summer 2011 Runway Show. Beautiful Crown TRIFARI gold toned textured leaf design brooch from the 1950s/1960s. 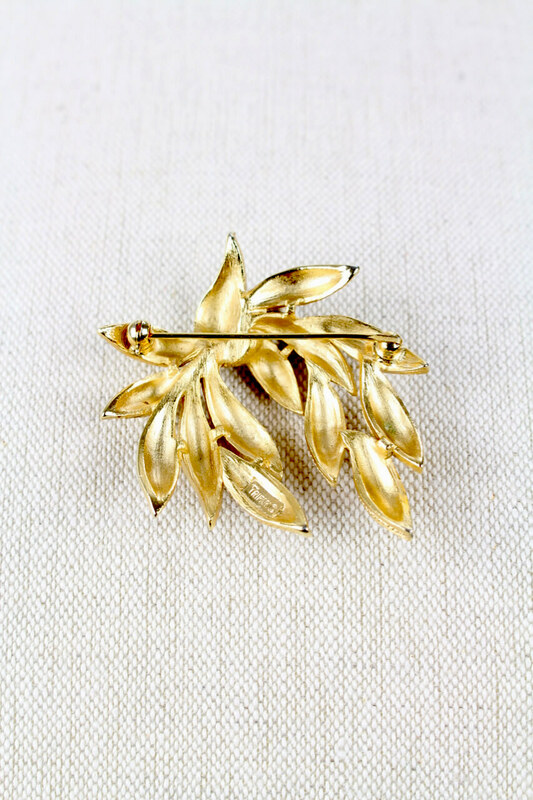 This mid-century Crown TRIFARI brooch features a stylized marine plant design. 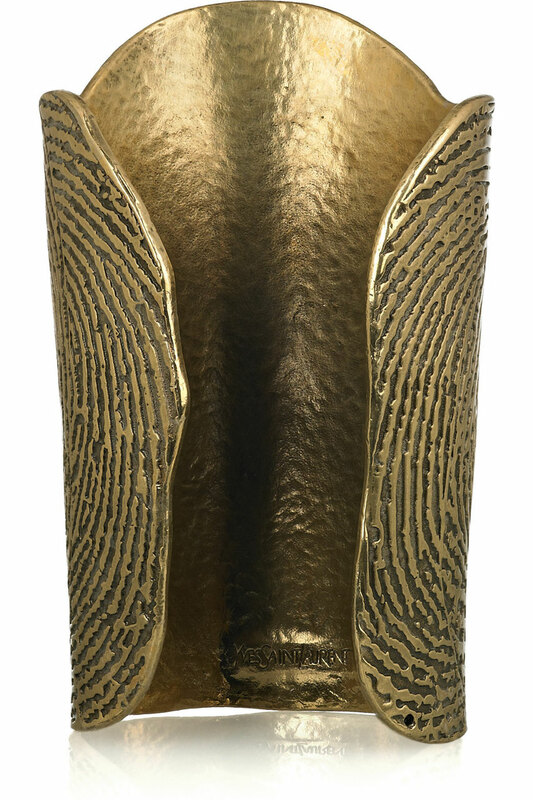 The gold toned design shows arched highly textured stippled leaves and closes with a secure roll over clasp at back. 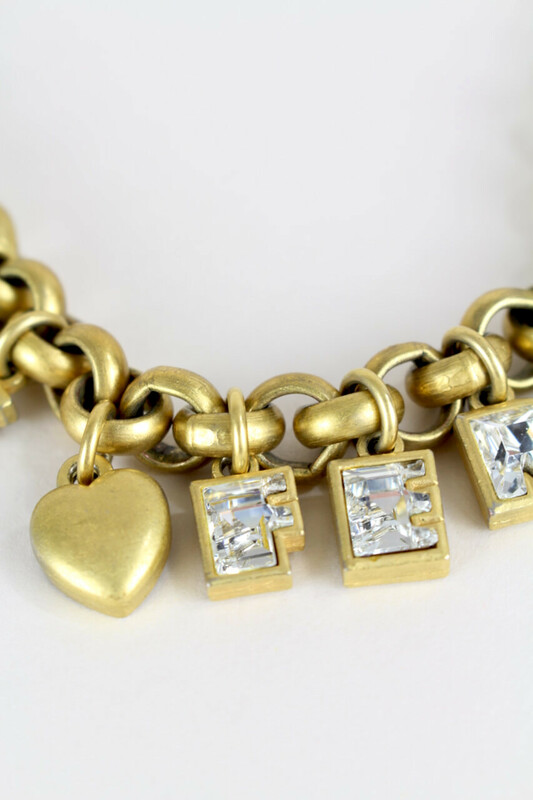 It is signed ""TRIFARI©" with a crowned T.
The TRIFARI Jewelry Company was created in the 1910s by Gustavo Trifari, the son of a Neapolitan jeweller, who had immigrated to the US from Italy in 1904. Considered one of the most respected and admired producers of costume jewelry in the United States, the company has designed jewelry that has been worn by countless high-profile clients, from Mamie Eisenhower to Madonna. 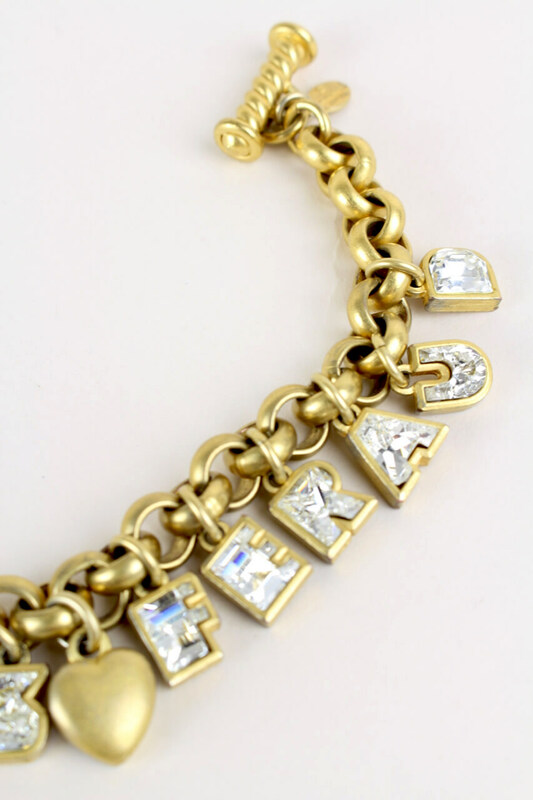 Height: ca. 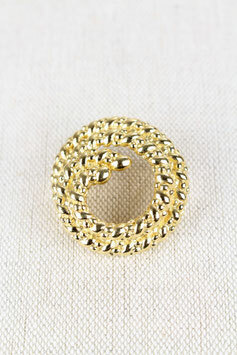 5 cm – 2"
Width: ca. 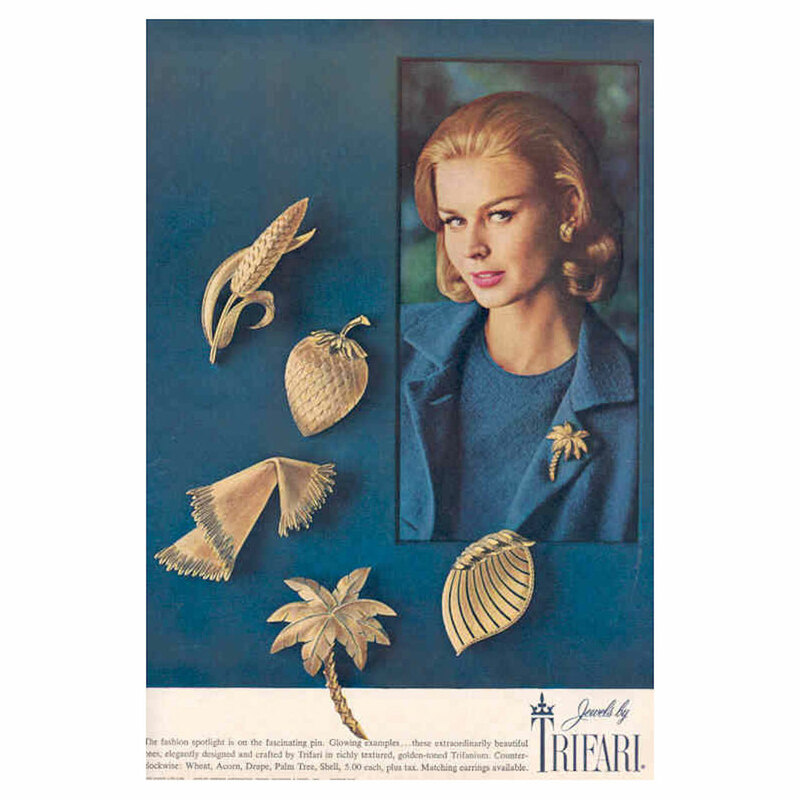 5 cm – 2"
Reference photo: TRIFARI advertising, 1960s. 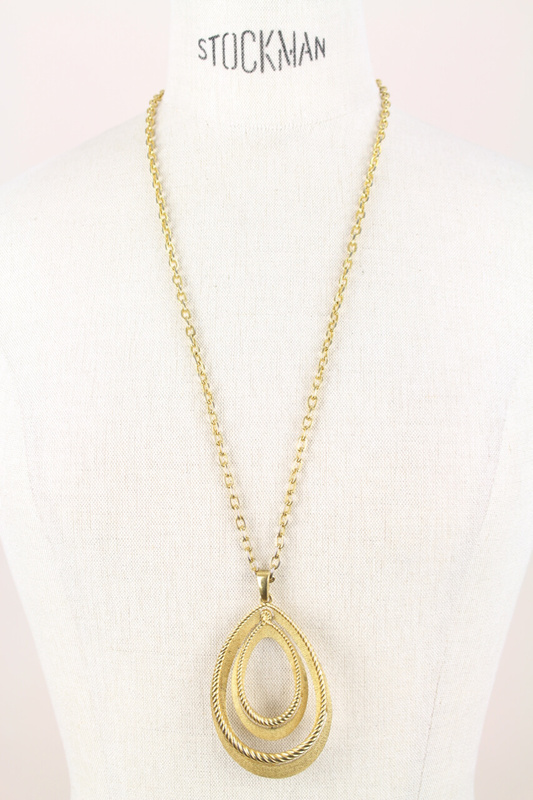 Decorative Crown Trifari gold-plated teardrop pendant necklace from the 1960s/1970s. 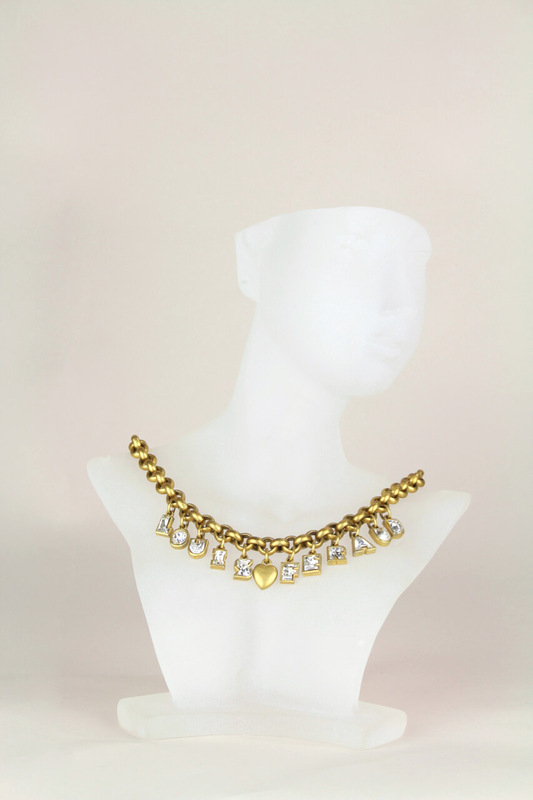 A modernist signed Crown TRIFARI gold-plated statement necklace with a teardrop pendant from the 1960s/1970s. 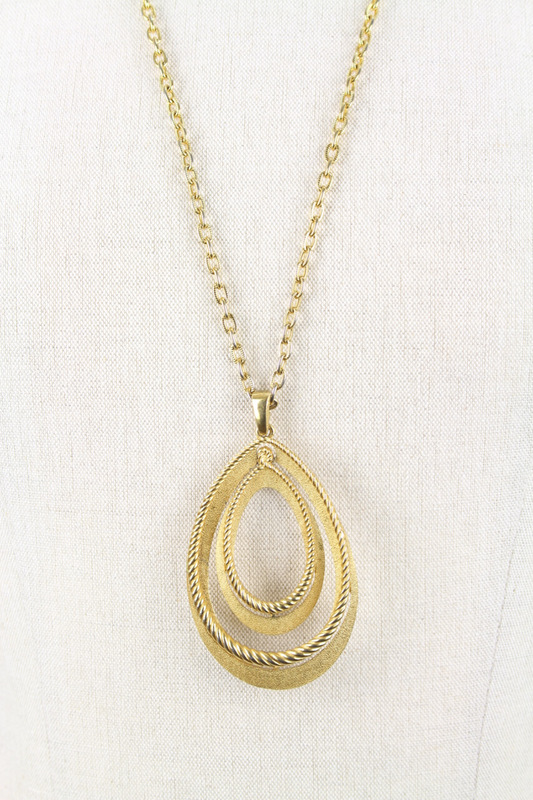 The very substantial and high-quality pendant is composed of two nested independent gold-plated metal drops each designed of a firmly connected shiny rope drop and an etched matt drop. 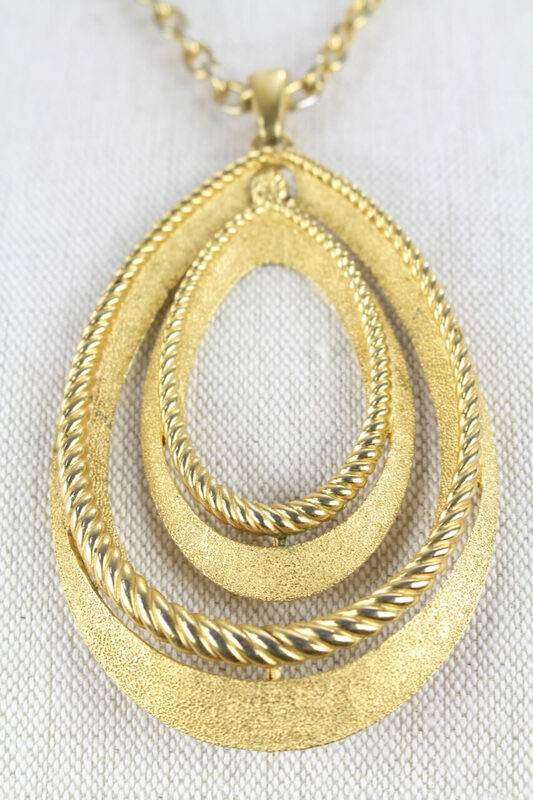 It comes on a shiny gold tone chain with textured links that is perfectly proportioned in size to max out the total look. 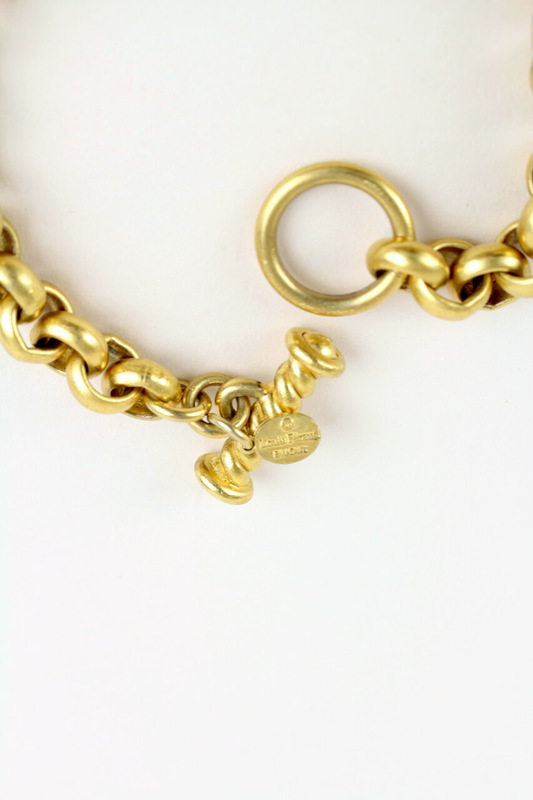 The piece closes with a secure spring ring clasp and is signed "TRIFARI" with a crowned T and copyright symbol. 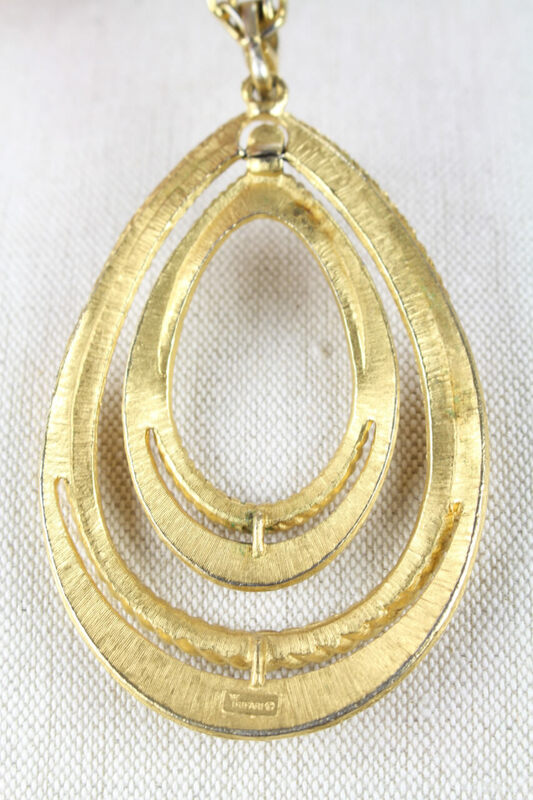 Excellent vintage condition with light surface wear on the pendant. 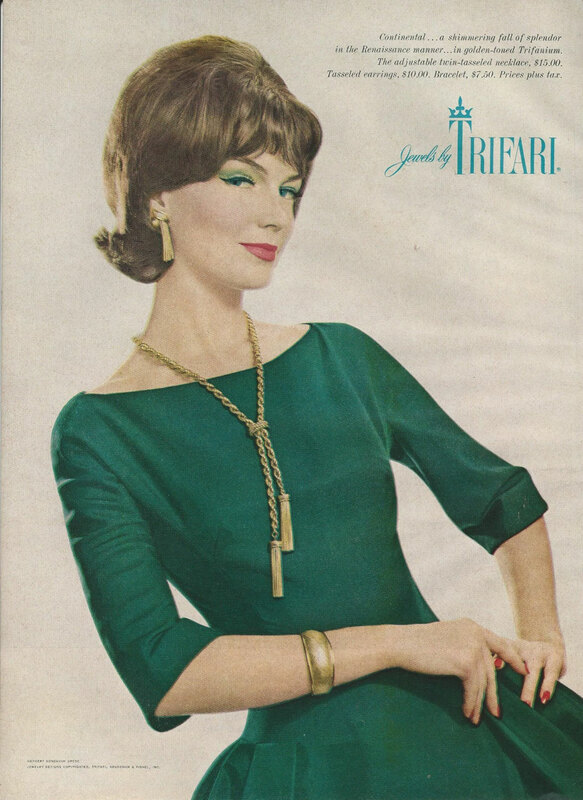 Chain Length: 73 cm – 28.7"
Reference photo: Trifari advertising, 1961. 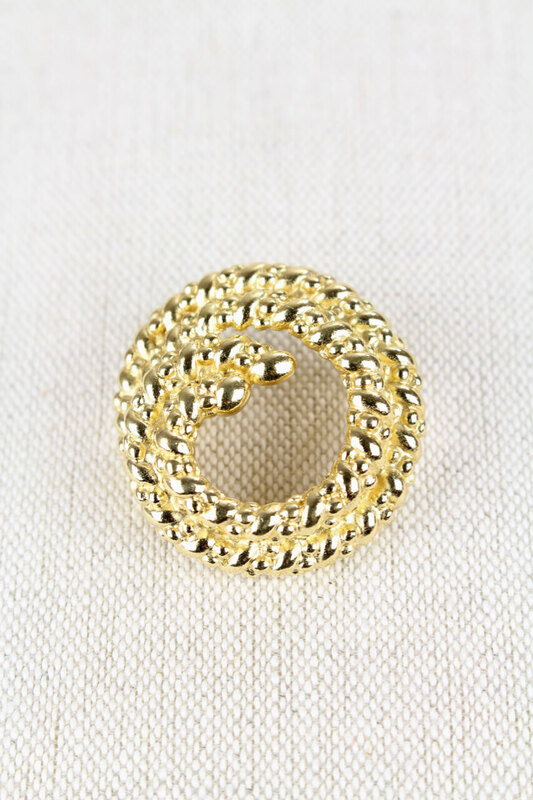 Fancy Christian Dior rope design brooch, circa 1970s. 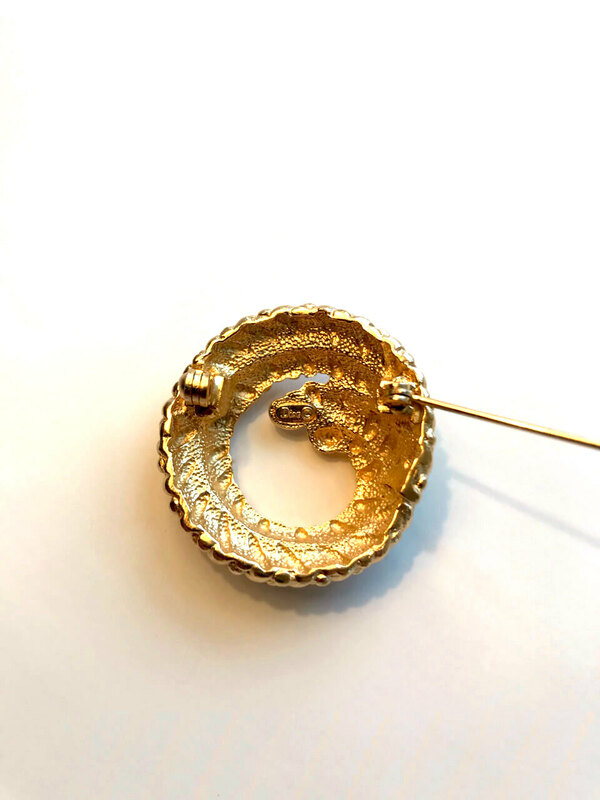 A stylish and elegant probably 1970s gold toned brooch from Christian Dior featuring an artistic circle coiled rope design and a secure roll over clasp at back. 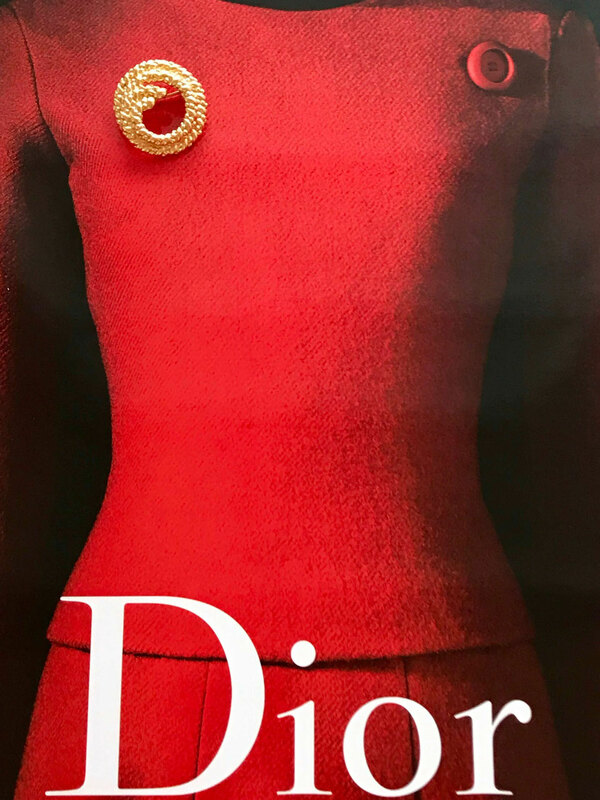 It is signed "Dior ©" on the reverse. 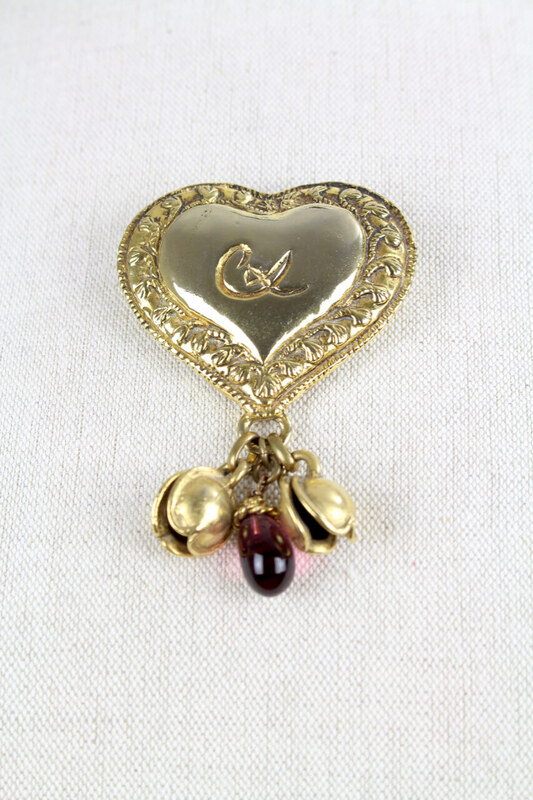 Height: 3,5 cm – 1.4"
Width: 3,5 cm – 1.4"
Stunning late 1980s / early 1990s statement heart-shaped perfume holder brooch with dangling charms by Christian Lacroix. 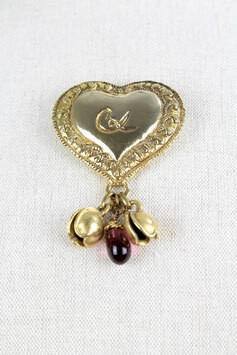 Christian Lacroix's line of statement jewelry features romantic motifs – from hearts to roses and seashells. 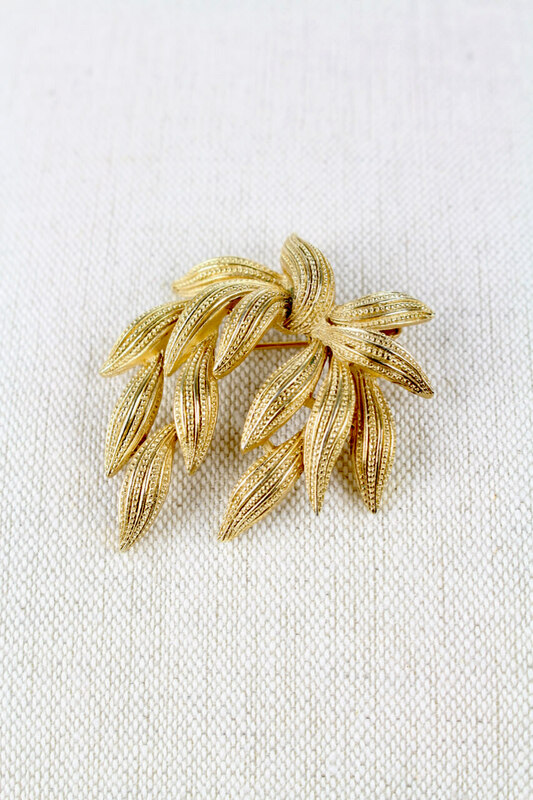 The designer’s retrospective style comes from years of studying art history as he originally intended to become a museum curator. 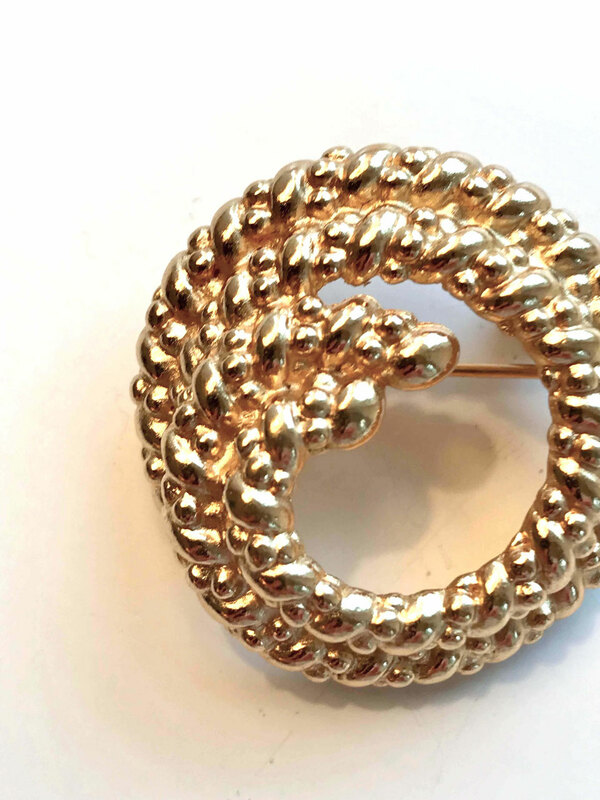 Launching his fashion house in 1987, the vintage-inspired pieces he created were elaborate and eccentric and propelled him to instant success. 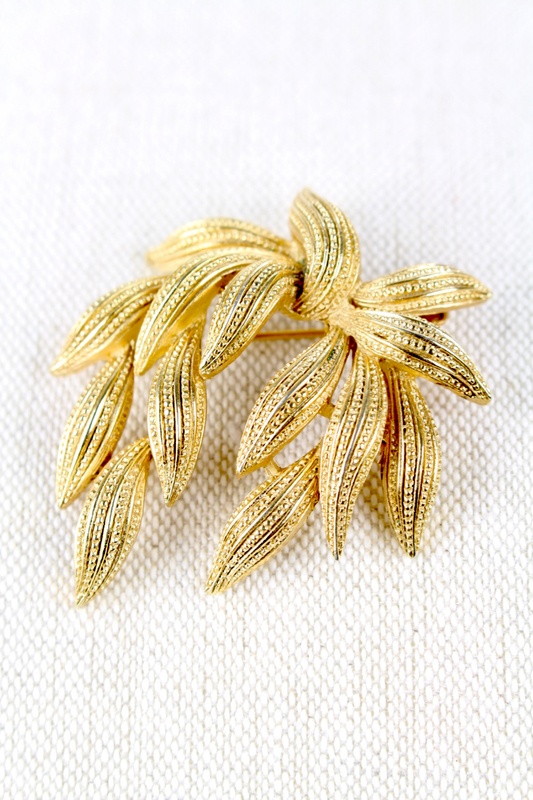 This fabulous large gold-tone metal brooch features a cushion effect that bears the Lacroix trademark in the center and an ornate border. 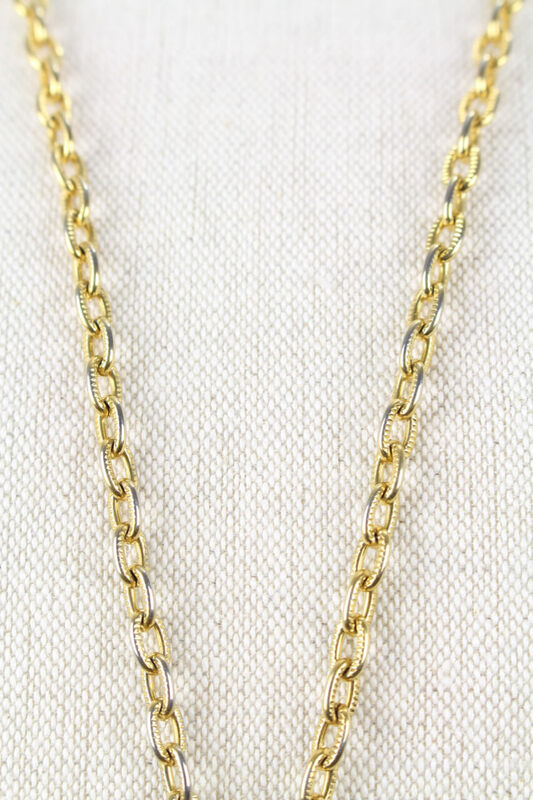 It is embellished with three dangling charms including a ruby-red glass bead that make a pleasant "tinkling" sound when worn or handled. 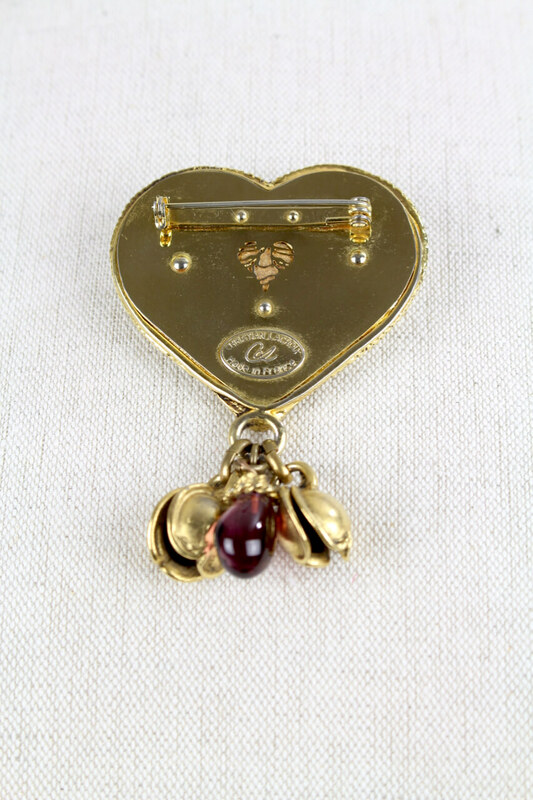 On the reverse is a heart-shaped cutout designed to receive your favourite perfume. 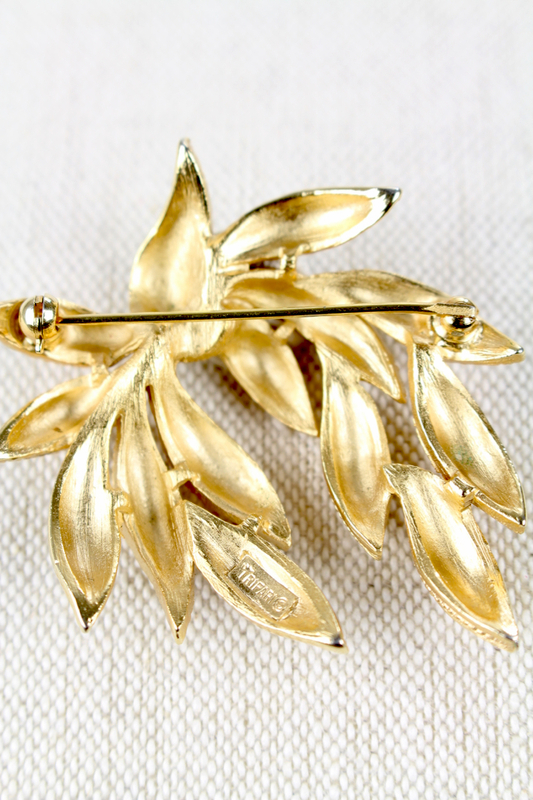 The brooch fastens with a rollover clasp which is in excellent working order. 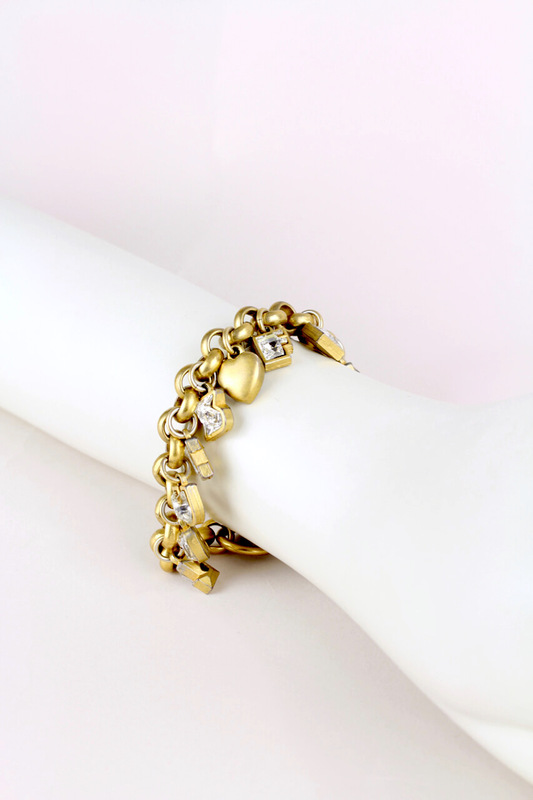 It is marked "CHRISTIAN LACROIX CL Made in France". 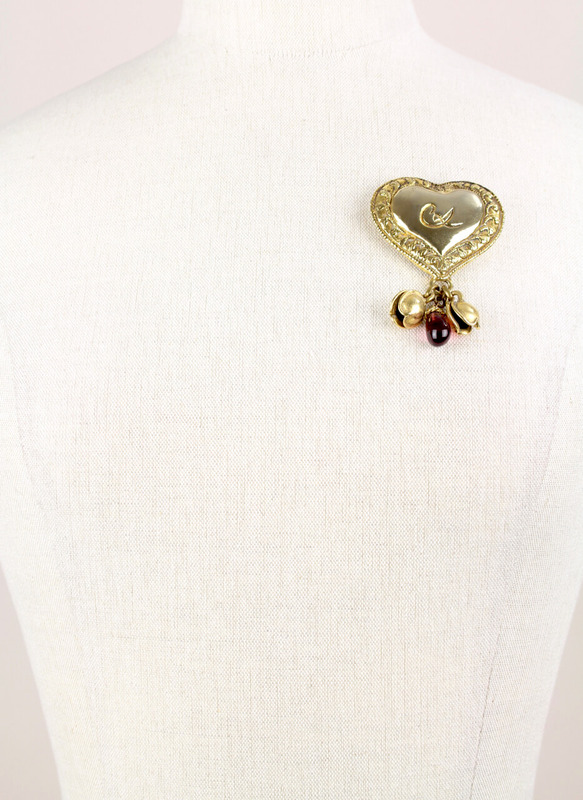 Width: 5,5 cm – 2.2"
Reference photo: Carla Bruni wearing a heart-shaped brooch at Lacroix's ready-to-wear collection, 1993.